In addition to the cinema business, it currently holds 10,000 square feet of Wan Chai office property with a valuation of more than 200 million yuan and another net cash of about 200 million. These businesses and assets add up to more than $3 billion, but why is the current market value of only $1.1 billion? Only because this connected transaction has greatly damaged and weakened the value of Orange Day! With 560 million yuan (about 630 million Hong Kong dollars) to acquire a 93,000 square meters commercial property in a second- and third-tier city, this commercial property has not been rented, has not been put into operation, and it will take another year to be put into operation after the purchase. Is this a good acquisition? Everyone needs to know that commercial properties in second- and third-tier cities in China are now difficult to operate. Just look at Lifu China (02136). Shenyang and Dalian Jiuguang Department Stores, which were originally operated, have been closed. They are currently vacant for sale. I don’t know when they will be sold successfully. Cash out. The more interesting thing about this Jiangyin property is that the area reserved for the operation of the cinema was legally disputed with the leasing party (Orange Tianhe Wo China, which has been sold to the Dadi Cinema). At present, the other party refuses to lease and operate, but it is to be acquired by Orange Sky Golden Harvest. After I came to operate by myself, I felt that it was the big shareholders who saw the wrong situation. I quickly transferred the hot potato to the listed company, and then I safely bag myself. 1. According to the acquisition circular, the total gross floor area of ​​the property is 93,137 square meters, but this total area does not match the 65,299 square meters disclosed in the official documents. Does the seller exaggerate the property area? 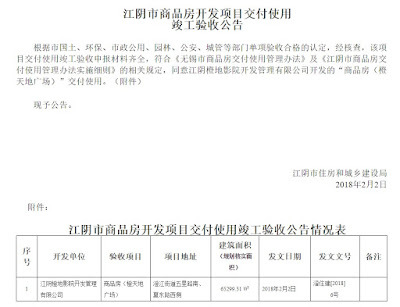 The Orange Day document does not match the information disclosed on the official website of the Jiangyin City People’s Government. The difference between the two areas is 27,839 square meters. If the information in the government documents is correct, does the seller exaggerate the building area by 42%, so that the average price per square meter of the property is greatly reduced from HK$9,648 to HK$6,764? I don’t know if the difference of 27,839 square meters is the property. The green area or public space, the seller and Orange Sky Jiahe should explain. 2. The seller acquired the land title in April 2011 and started construction in September 2011 (see media report: Jiangyin Orange Tianhe 66 Integrated Studio Project will start in Asia), and according to the acquisition circular, The complex was completed in December 2016. Why has it not been opened until November 2018, even after the completion of the acquisition, it will not be open until the fourth quarter of 2019? Apart from the problem of operating in the cinema, will it be related to the difficulty of renting? Should the seller also disclose the progress of the renting? 3. The original plan of the property leased the theater to a third party. Now, due to the refusal of the orange sky China, which was sold to the Dadi Theater, Orange Sky Golden Harvest, which has withdrawn from the domestic market, has re-entered the market. However, it is necessary to know that the days before the sale of Orange Sky China by Orange Sky Golden Harvest, the domestic cinema business has been in a loss state. Now the saturation and penetration rate of the domestic cinema market is much higher than before, and the competition is more intense. Take Jiangyin City as an example. According to last year’s online news (Reference: Good news! Another well-known cinema stationed in Jiangyin! Just opened in this shopping plaza), the number of theaters that will be put into operation or already in operation is as much as 18, and Orange Sky can break through. And out?